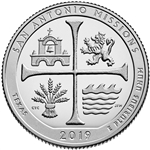 This San Antonio Missions National Park Quarter design depicts elements of the Spanish Colonial Real coin to pay tribute to the missions. Within the quadrants are symbols of the missions: wheat symbolizes farming, the arches and bell symbolize community, a lion represents Spanish cultural heritage, and a symbol of the San Antonio River represents irrigation methods and life-sustaining resources. Inscriptions are "SAN ANTONIO MISSIONS," "TEXAS," "2019," and "E PLURIBUS UNUM."